The world of college volleyball will be seeing pink this weekend, and there’s no need to adjust your television sets. The Side-Out Foundation has an annual fundraiser in October to raise awareness for breast cancer. Players across the nation, from youth and high school leagues through to college, will be competing in “Dig Pink” volleyball matches this weekend, which will continue throughout the month. Teams competing this weekend and for the Side-Out’s Dig Pink Rally will wear pink, have pink towels laid across their arenas and have the game be about raising money and awareness to this disease. 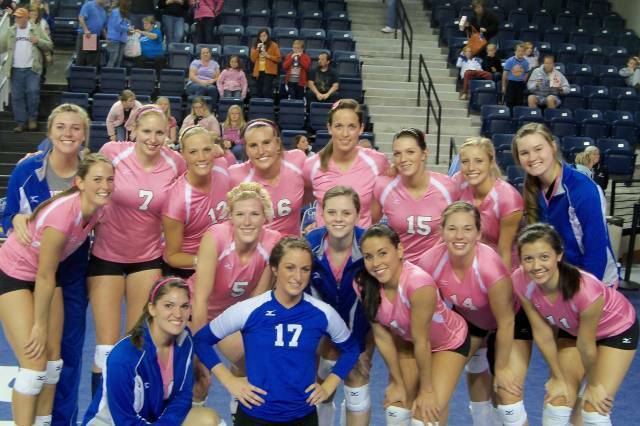 Volleyball teams such as Baylor and TCU will be competing in the Dig Pink Rally this weekend. This event is an active way for players, spectators and coaches to get involved in something that is bigger than the match. The money raised goes to furthering research to find a cure for cancer, specifically breast cancer in this case. Although in this case it is colleges that will be competing, this is something that can be done at middle school and high school level. If you would like to host a dig pink event at your school, go to the website to find out more. There are also other ways to support breast cancer if you cannot make it to a Dig Pink Match, by donating through the organization.